The HL-2270DW is a monochrome laser printer that offers an automatic duplex capability for printing two-sided documents with ease, fast printing at up to 27 pages per minute, and built-in wired and wireless networking for sharing with others. It features a stylish, space-saving design that fits virtually anywhere and complements any environment. In addition, it offers convenient paper handling via an adjustable, 250-sheet capacity tray. Affordable to own and operate, the HL-2270DW uses a high-yield replacement toner cartridge to help reduce your operating costs. 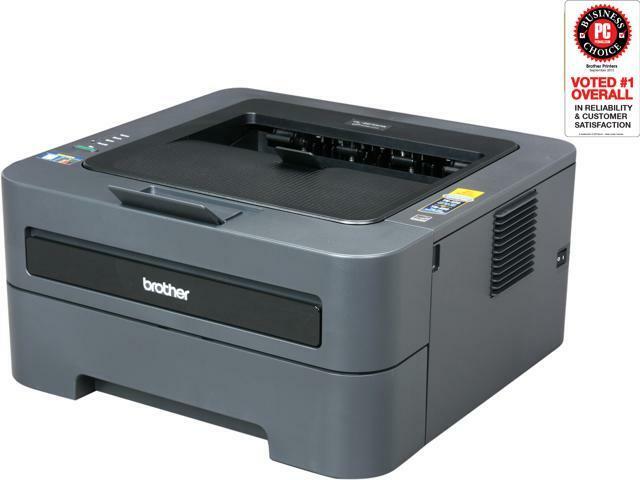 The Brother HL-2270DW is an economical way to connect all your computers to one brilliant laser printer! Flexible networking The HL-2270DW features wired Ethernet and 802.11 b/g wireless network connectivity for connection to your home or office network, so you can share the printer among multiple computers. With the wireless connectivity, put the HL-2270DW anywhere that is convenient. Easily print two-sided documents The HL-2270DW produces professional-looking two-sided documents, brochures and booklets using the automatic duplex printing feature. This feature can help reduce your paper use and save money. Fast laser printing The Brother HL-2270DW features breathtaking print speeds of up to 27ppm in monochrome to improve your productivity. High-quality output With print resolutions of up to 2400 x 600 dpi, the Brother HL-2270DW produces professional-looking output with crisp text and excellent graphics. Convenient paper handling The HL-2270DW can meet all of your printing needs via an adjustable, 250-sheet capacity paper tray that easily handles letter or legal size paper and a manual feed slot for printing envelopes and letterhead. Toner Save mode Use less toner and save money by using Toner Save mode for your less critical business documents. Custom Sizes: 3.0" - 8.5", 4.57" - 14"
Cons: black and white only. Pros: Very crisp black and white prints. Easy to get toner and replacement cartridges. Very inexpensive for a high quality printer. Cartridges and toner are readily available. Not too loud. Easy setup. Most reviews are positive. Very popular highly purchased printer. Wireless use usually works great and I depend on that every day! If you leave it on standby mode, it will work fine. No need to power it down as it uses only 3 watts in standby mode. Never once have had a problem with wireless connection. No need to ever turn it off. Duplex Printing is always however you set it up to be. The back page, if you use the duplex mode, is oriented which ever way you want. Read directions and setup this printer the way you want it. Cons: Startup cartridge is not fully loaded with toner. You will need a new cartridge very quickly if you use this at a moderate to heavy usage level. On the plus side, replacement cartridges and toner are readily available for this particular model. Even generic cartridges and generic toner can be easily found. No LCD display. Have to interpret problems via the LED lights. a sticker on the machine helps you interpret the LED codes. So far, after a couple of years, I have had no problems other than an occasional paper jam. Other Thoughts: Be sure to get your firmware updated online at Brothers as soon as you set it up. This printer does put out some great copies and you can save paper by using both sides. If you want to know why I take the time to write reviews, it is what I depend on before buying anything. If you are reading this, please write your own reviews so others may benefit from your experience. This system works only if you contribute. Thanks. Pros: Duplex feature very useful. No issues printing from multiple computers. Works fine with Windows 10. Have not used wireless feature. Recommend getting high capacity toner as it is more economical when you calculate price per page. Cons: Default setting is to stop printing when it senses the toner is low. By changing that setting I have gotten dozens of additional pages. In fact after several months of low toner warnings I am still getting good copies. I shake the toner now and then. Pros: [-] Printed at least 25000 pages, at least! Cons: [-] Drum is -expensive-, unusually and ridiculously! BUT.. it -may- not be an issue, read the "other" for ensuing stupidity on my part. Other Thoughts: So, we were moving houses. To ensure toner didn't rattle loose throughout the printer, I remove the toner cartridge (and since the cartridge, yes the one that it came with, lasted at least 2000 pages - I figured I would just replace the toner cartridge with a new one when we got to the new house 600 miles away). Welp. Because it was 2000 pages ago that I had to put the toner cartridge in, I had forgotten that the toner cartridge snapped into the drum roller, err, cartridge? Yeah. So I discarded not just the toner, but the entire toner/drum assembly. Woops. I realized this when I bought a new toner cartridge and went to put it into the printer (was my first laser printer - was purely Inkjet before that, dot matrix before that, etc... "Why wont it fit right?" So, I priced a new drum, it was more than the current price of the printer itself (it was only 80 bucks then). Woah.. So, what to do? Yep, buy an entirely new printer just for the drum and "stock" toner. So now I have a brand new printer less drum/toner on "standby". I may dig that out, as this one has stopped working via WiFi. Glad I made that "mistake" because I'd be paying 120 dollars more. Cons: Bad wireless support, constantly looses wireless connection. I have constantly had to troubleshoot connectivity issues when I just wanted to print something. All other wireless devices would be functioning in harmony, yet the printer would have inexplicably lost it's connection. Other Thoughts: It was a good deal when I bought it. Cons: This printer stopped working after about a year. But, since I purchased the 3-year warranty, I thought it would be no problem. Apparently, the way the warranty works is that they refund you the price you originally paid. Of course, the current price is double what I paid. I don't want my money back... I want a printer that works! I'm going elsewhere. Cons: Toner is a bit expensive, but comparable to competitors. Other Thoughts: Installed in a small office. Prints about 75 to 125 pages per week. Still on original drum. Most likely will have to replace soon. There are about 4 to 5 PCs using this printer. Pros: Reliable. Very, very reliable. Has currently printed more sheets than all inkjet printers I have ever owned combined, and its still on the initial toner cartridge (Essentially, the main thing you want from a printer is to actually work, unlike every HP and Lexmark printer I have ever owned). Stays connected to our wifi network. Accessible with little effort from both Windows 7 and OSX Snow Leopard. Cons: The main drawback is that the toner warning fires too early. Based on reviews collated from around the Internet, you should expect between 700-1100 sheets printed on a single toner cartridge. Search Internet for user maintained instructions before replacing toner. Exhaust fan location is not ideal for where I would prefer to place it in my house, but this is more than compensated for by how reliable this printer is.